I don’t know of any sequel in recent memory that matches the original and “The Incredibles 2” is no different. That being said, it’s pretty darn close. It’s been 14 years since “The Incredibles,” the 2004 animated Pixar film about the adventures of a family of superheroes trying to fit into a culture that has outlawed “supers” as they were called. The new film picks up right where that one left off. Bob Parr/Mr. Incredible (voice of Craig T. Nelson) and Helen Parr/Elastigirl (voice of Holly Hunter), together with their teenage daughter, Violet (voice of Sarah Vowell), and son Dash (voice of Huck Milner) battle the Underminer. 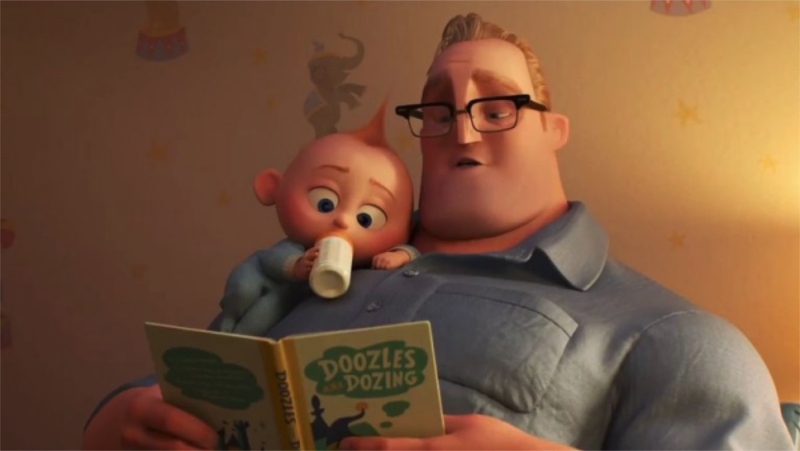 Violet and Dash argue over who’s going to watch baby Jack-Jack (voice of Eli Fucile) while Bob and Helen do the majority of the hero stuff. The thing is, even though the Parrs, together with their super cool superhero friend, Lucius/Frozone (voice of Samuel L. Jackson), are trying to improve the public’s view of supers, it’s still illegal for them to use their powers out in the open. Enter Winston Deavor (voice of Bob Odenkirk) and his sister, Evelyn (voice of Catherine Keener), moguls of a tech company who want to make “supers” legal again by getting the public on their side. They choose Helen as Elastigirl to be the face of their campaign and, after talking over the situation with Bob, she agrees. She leaves the kids in Bob’s care, excited to be doing super stuff again. But Bob’s superhero talents don’t prepare him for the challenges of being a stay-at-home Dad. Violet’s having relationship difficulties and Jack-Jack is manifesting his considerable powers. One of the best scenes of the film comes when Jack-Jack escapes his napping Dad to take on an unsuspecting raccoon out in the backyard. The spectacular Edna Mode (voice of Brad Bird), the designer of cape-free super suits, even agrees to babysit Jack-Jack so she can make him a suit that (ahem) suits his fledgling powers. The film flags a bit when Helen and Bob are apart, although their situation will speak to any parents who juggle the rigors of parenting with job demands. Plenty of moms out there will totally get the phone call Helen gets from Dash as she’s speeding around on her motorcycle trying to catch the bad guy when she has to patiently explain where he can probably find his shoes. The villain of the story is Screenslaver, who hypnotizes anyone who looks at a computer or TV screen and forces them to do whatever Screenslaver wants. Although not the main part of the film, Screenslaver’s rant against how much time people spend staring at screens instead of engaging with the real people standing right beside them is an appropriate calling-out of our screen-obsessed culture. Ironic that it happens while you’re watching a screen. A visually stunning film, especially when director Brad Bird uses old-style cartoon animation for a fight sequence, “The Incredibles 2” is a family friendly film that emphasizes that family comes first. Each in their own way, the members of the Parr family are amazing superheroes. But what’s really incredible about The Incredibles is that they are most strong when they do their “super” thing together as a family.